Written on March 6, 2018 . Posted in Announcements + Updates, European Honors Program, Foundation Studies. Leslie Hirst (Associate Professor, Experimental and Foundation Studies and EHP Chief Critic 2017/18) is exhibiting new work at the Gallery of Art Temple University in Rome. 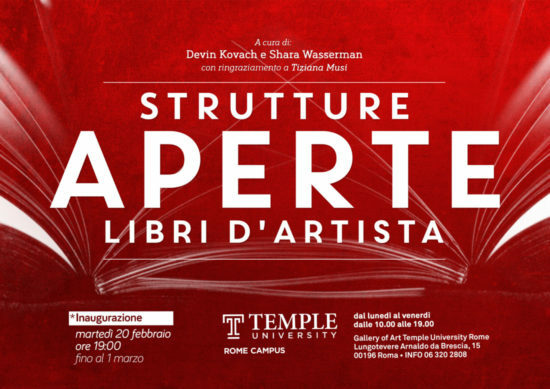 The exhibition is entitled, Strutture Aperte: Libri d’Artista (Open Structures: Artist Books), and is curated by Devin Kovach and Shara Wasserman. The exhibition explores the terrain of the artists’ book as a form that is connected to many artistic traditions, but that seems to resist any single classification, category, or technique. Bringing together extraordinary examples of artist books by small-run book publishers such as Sergio Pandolfini’s Edizioni Il Bulino, HD Edizioni, and NERO, alongside experimental works by established and emerging artists, the exhibition presents various conceptual impulses through the diverse methods, narratives, and materiality embedded within the structure of books.